Project from spring 2012 making preparations with layout sketches and field-work for designing and building-up a new natural history exhibition at the National Museum in Bhutan. Opening December 2012. 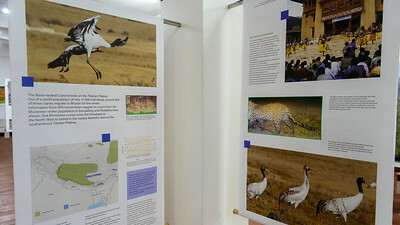 While writing the exhibition contents, many great nature photographers willingly donated the use of their photos of birds and mammals for the exhibition posters. The project had not been possible if not for these many kind wildlife photographers. The opening of the exhibition. 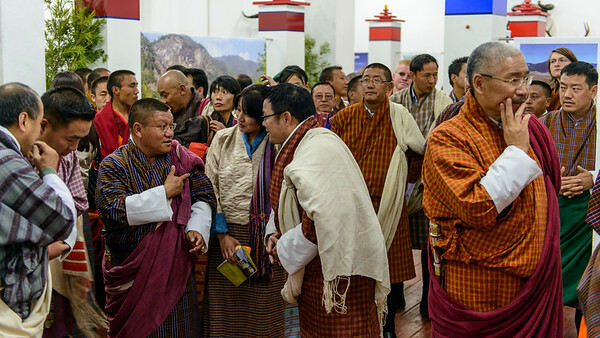 Her Royal Highness Dechen Yangzom Wangchuck is welcomed by Museum Director Khenpo Phuntsok Tashi and the museum staff. 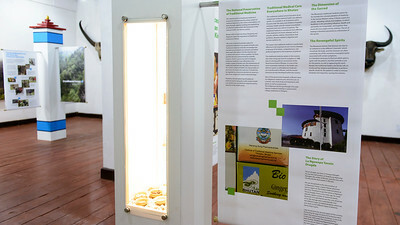 A DANIDA-granted project, curating a new exhibition March-December 2012 at National Museum of Bhutan. 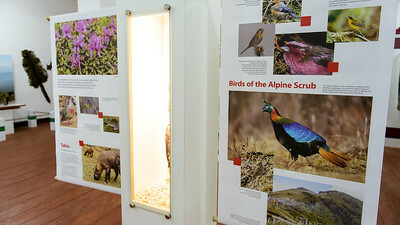 The exhibition "Natural History Gallery" opened December 2012. 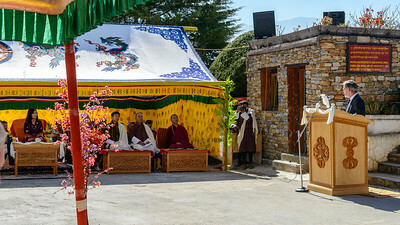 Museum Director Thomas Secher Jensen is adressing his celebration speach to Her Royal Highness Dechen Yangzom Wangchuck. December 2012. 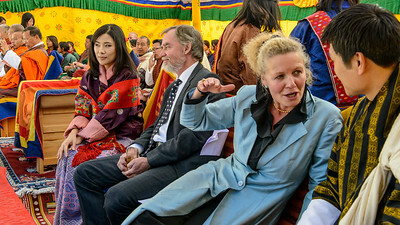 Her Royal Highness Dechen Yangzom Wangchuck, Director Thomas Secher Jensen, Curator Ditte Marie Seeberg in conversation with Dasho Tandin Namgyel, husband to Her Royal Highness. 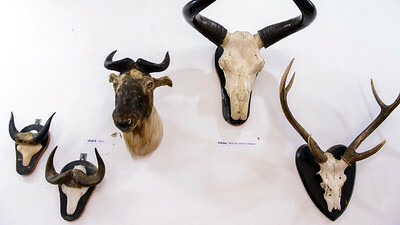 The exhibition "Natural History Gallery" opened December 2012. 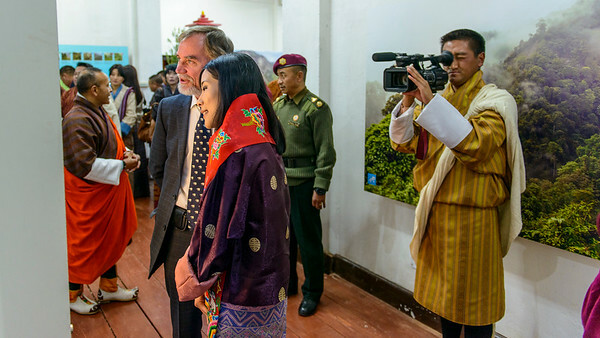 Her Royal Highness Ashi Dechen Yangzom Wangchuck in conversation with Director Thomas Secher Jensen. The exhibition "Natural History Gallery" opened December 2012. From the opening. Dashos, ministers and other invited persons in the exhibition. 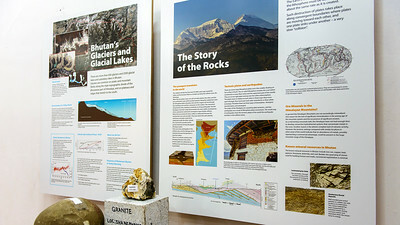 The exhibition "Natural History Gallery" opened December 2012. 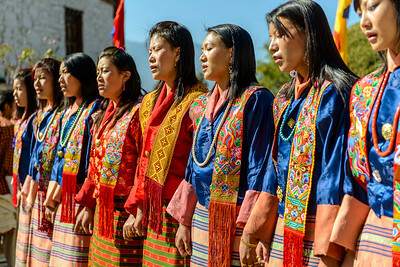 Singers from the Royal Academy of Performing Arts perform traditional hymns. 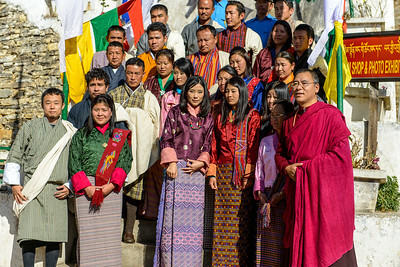 Her Royal Highness Dechen Yangzom Wangchuck (center), together with Khenpo Tashi Phuntsok (right) in front of the Museum Staff. December 2012. 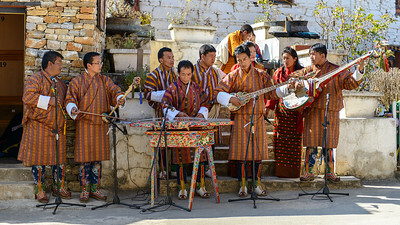 A great classic Bhutanese orchestra entertaining the guests at the opening of the exhibition "Natural History Gallery" December 2012..
View from the exhibition Natural History Gallery at National Museum of Bhutan. December 2012. 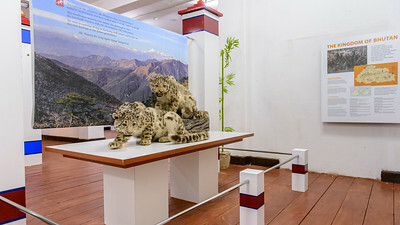 Snow leopards at the entrance. View from the exhibition Natural History Gallery at National Museum of Bhutan. "Natural History Gallery" December 2012. View from the exhibition "Natural History Gallery" National Museum of Bhutan, December 2012. Life og the Alpine Steppe. 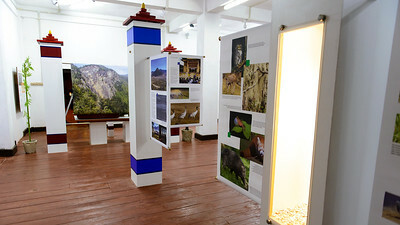 View from the exhibition 'Natural History Gallery' at National Museum of Bhutan. December 2012. Some of the Goat Antelopes and Cervids of Bhutan. 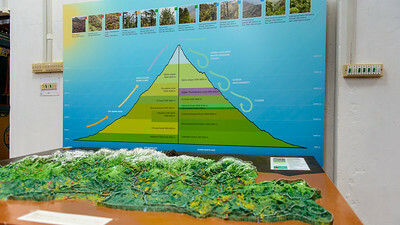 View from the exhibition Natural History Gallery at National Museum of Bhutan. December 2012. Life of the Alpine Scrub. 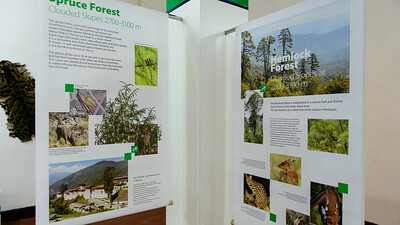 View from the exhibition 'Natural History Gallery' at National Museum of Bhutan. December 2012. 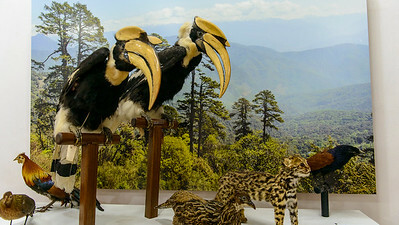 Great Hornbills with cats and other bird species. 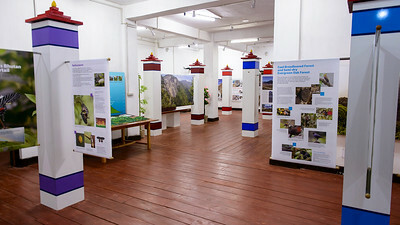 View from the exhibition Natural History Gallery at National Museum of Bhutan. December 2012. 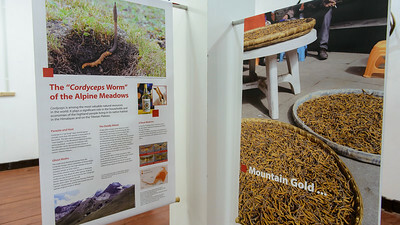 Mountain Gold ... the short and deadly life-story of the valuable Cordyceps Worm. 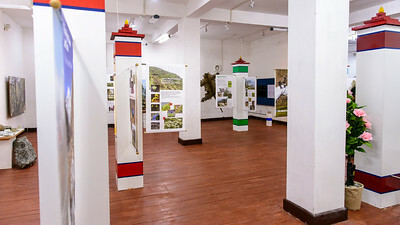 View from the exhibition 'Natural History Gallery' at National Museum of Bhutan. December 2012. Life in the Fir Forest. View from the exhibition Natural History Gallery at National Museum of Bhutan. December 2012. 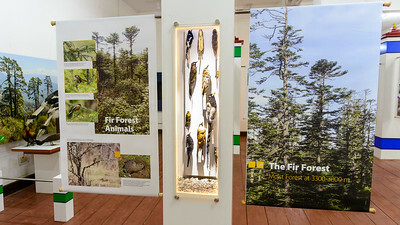 Trees and animals in the Spruce Forest. 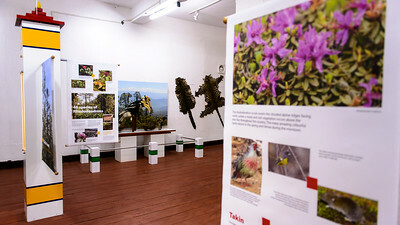 View from the exhibition 'Natural History Gallery' at National Museum of Bhutan. December 2012. The Black-necked Crane on the wintering grounds in Central Bhutan. 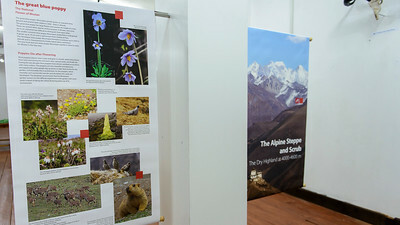 View from the exhibition 'Natural History Gallery' at National Museum of Bhutan. December 2012. Job done. View in the exhibition hall a few hours before the opening ceremony. 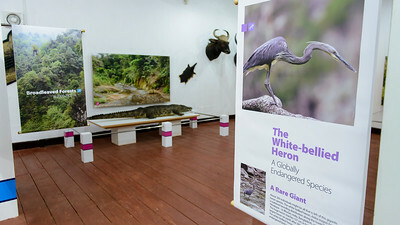 Natural History Gallery at National Museum of Bhutan. December 2012. Altitude and the vegetation zones on the dry South-slopes and moisterNorth-slopes. View from the exhibition Natural History Gallery at National Museum of Bhutan. December 2012. Life og the Cool Broadleaved Forest. View from the exhibition Natural History Gallery at National Museum of Bhutan. December 2012. 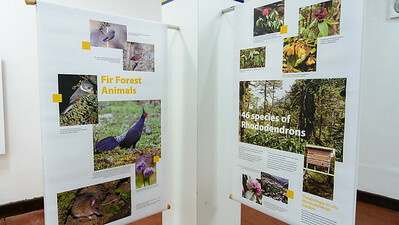 The Rhododendrons and other life of the Fir Forest. 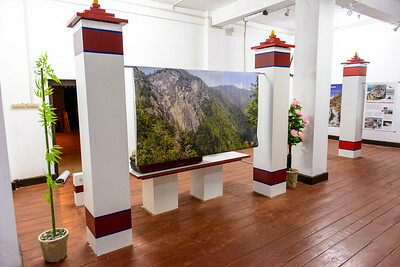 View from the exhibition 'Natural History Gallery' at National Museum of Bhutan. December 2012. Traditional Medicine of Bhutan. Life of the Subtropical Lowland Forest. View from the exhibition Natural History Gallery at National Museum of Bhutan. December 2012. The rare White-bellied Heron in the Life of the Broadleaved Forest. 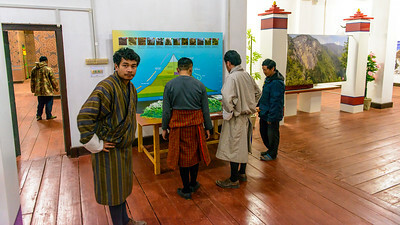 View from the exhibition Natural History Gallery at National Museum of Bhutan. December 2012.